Do you ever find yourself at work, not even close to lunch hour, but starving even after having a well-balanced breakfast? This happens to me all the time. I always bring some kind of snack to work to hold me over until lunch. It’s usually some kind of granola bar, nut mix, or muffin. I found this recipe on King Arthur Flour’s website, and I was stoked because it would mean I can use some of my whole wheat flour. I was looking for something somewhat healthy, but also would satisfy my sweet-tooth cravings. I think bananas and chocolate chips make a really great combo. You really get the subtlety of the banana flavor with a pop of chocolate flavor. Every morning when I bring these to work, I look forward to eating them. What I did was store my batch of muffins in the freezer. When I wanted to bring one to work, I took it out that morning and microwave it at work for about 20-30 seconds. It comes out warm and the chocolate becomes gooey… just the way I like it. 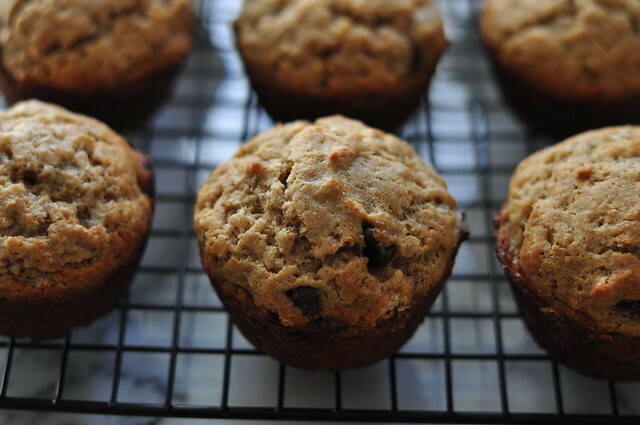 Preheat the oven to 350 degrees F. Lightly grease or line with paper liners the 12-cup muffin pan. For the flour mixture, whisk the baking powder, baking soda, salt, and flours, stirring until combined. In a separate bowl, mix the butter and sugar until smooth. Then add the mashed banana, egg, vanilla, and milk. Mix until combined. Add the flour mixture to the wet mixture, making sure there are no lumps in the mixture once combined. Divide the batter evenly between the 12 muffin cups. They will be full cups. 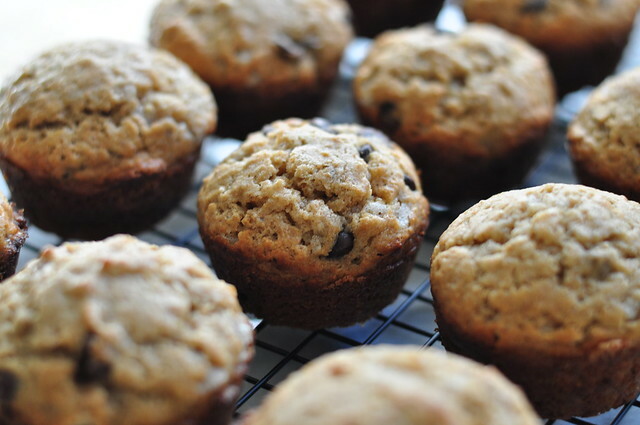 Bake for 20-23 minutes, until a toothpick inserted in the middle of a muffin comes out clean. 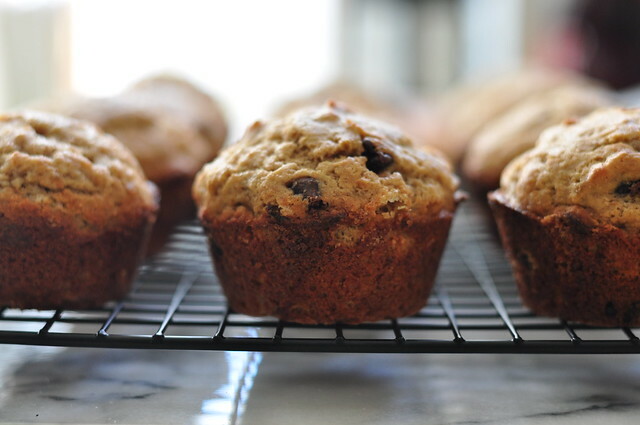 Let the muffins cool for 5-10 minutes in the pan, transfer them to a wire rack to cool completely. This entry was posted in Muffins, Recipes and tagged baking, bananas, breakfast, chocolate, chocolate chips, muffins, recipes on May 30, 2013 by Krystal.